Backwater valves are becoming popular additions to home sewers. They perform a very important task: protecting the home from flooding due to city sewer backups caused by flash flooding. Since flash flooding has become more common in the past few years, the city now offers a $1250 rebate off the installation of a backwater valve in Toronto. 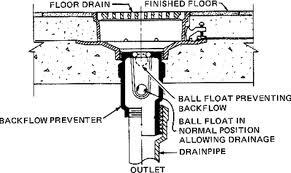 A backwater valve is a device that prevents sewage in an overloaded main sewer line from backing up into your basement. The valve automatically closes if sewage backs up from the main sewer. A properly installed backwater valve must be placed so that sewage backup is stopped and does not come out through other outlets in your basement, such as sinks, toilets, showers and laundry tubs. 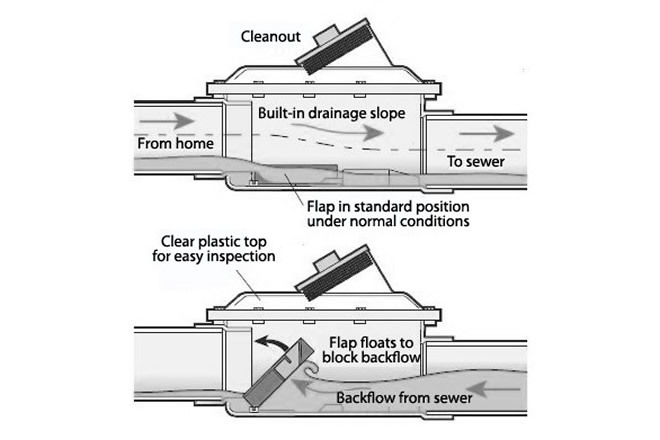 A backwater valve is a one way flow control valve installed in a drainage system, that under normal conditions allows the waste water to drain out of the system but if a reversal of flow should occur, the valve will be forced closed and protect the interior of the building from sewage backup. Every year thousands of homes are flooded with raw sewage and storm water causing millions in damages that could have been avoided with properly installed backwater valves. Backwater valves are required to protect fixtures and drainage openings that are installed below grade; such as in a basement, where the possibility exists for the municipal sewage or storm water systems to become overloaded and force waste water back through your drains. Backwater valves are also required on any subsoil drainage pipe that connects into the sanitary drain, to protect it from sewage backups. The most common backwater points of entry into your home may be through basement floor drains, water closets, sinks, laundry standpipes and sump pits. Backwater valves come in two main types; normally open or normally closed and they are installed in specific locations according to their type. Both types of backwater valves are required to be accessible however; so that they can be inspected and the drains they serve can be cleaned. Normally closed backwater valves are the most commonly installed and operate with a simple swinging disk or plate that opens only in the direction of flow. These types of backwater valves are installed on a branch that serves a group of fixtures; such as a basement bathroom group, or on an individual fixture drain ; such as a floor drain. A normally closed backwater valve is not permitted to be installed on a building drain as it would prevent the free circulation of air within the drainage and venting system. Normally open backwater valves are designed to be installed on the main building drain to protect the entire drainage system. These valves have a floating gate that will rise under a backflow condition with the water level. One of the more popular types of normally open backwater valve is the "Mainline" which has a clear cover and also incorporates a cleanout fitting below the valve. These valves require an annual inspection to ensure they will operate properly and nothing is blocking the gate.